“Nyam be Melanau” generally means the taste of the Melanau people. This article is about the culture of the Melanau especially their food heritage which is Sago. Melanau is part of an ethnic group indigenous to Sarawak, Malaysia. In other words, Melanau is categorized into 8 divisions. They are Melanau Matu Daro, Pulau Bruit, Dalat, Oya and Melanau Mukah. The more well-known ones are the Melanau Dalat, Oya and Mukah. The Melanau differ from most other Borneo people in one important aspect. They eat sago in preference to rice. Sago palm originally grew wild in the coastal swamps, and were eventually cultivated by the Melanau folks. The ten metre high palm tree has starch grown inside it. It swells just before flowering and at the right time to harvest is when it fells from the tree trunk. The trunk is then split open, and the starch-bearing pith is removed. The pith is rasped to fine mash. This is soaked in long wooden trough which is Jalur in Melanau. 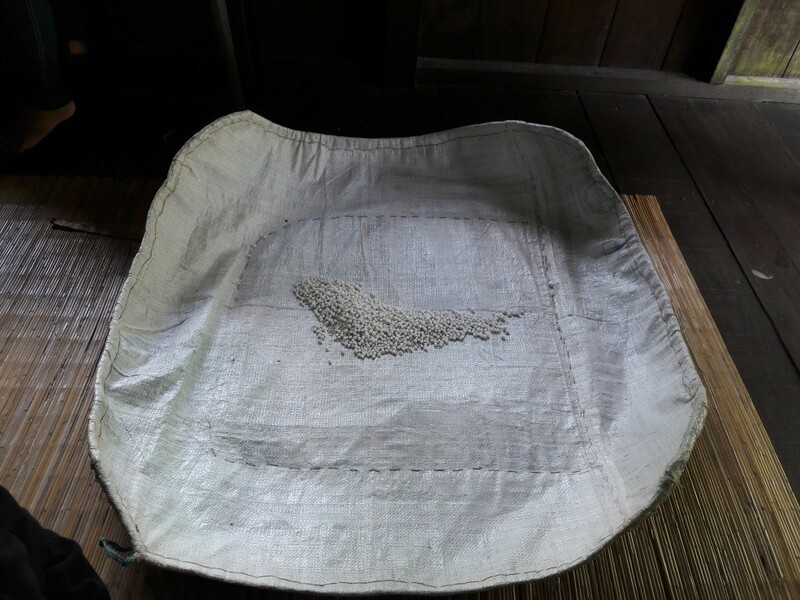 It is then trodden on a mat to leach out the sago starch. The white sediment settles at the bottom of the jalur. It is then spread out on mats to dry. They will then be crushed into flour. Generally sago starch is similar to starch obtained from maize, potato and wheat which can be used for making bread, biscuit, cake, noodle, crackers, cendol, pudding, chilli and tomato sauces. "Sago" and "tebaloi" biscuits are the most favourite Melanau traditional food which can be made from the sago starch. Before this, one of our friends ever gave us their delicious sago but we could not even ask for more because it was just too delicious and not enough for everyone. She brought it from Mukah and therefore, we want to explore more for the taste of the Melanau people itself. Recently, we went for our short trip to Sarawak Cultural Village as we thought we would be able to find something interesting about Melanau culture and walla! We found it! We found the Melanau house after a 20 minutes’ walk. This elderly woman introduced herself as Puan Sue sat in the house cooking something that is very unusual. Before we walked in to the house, we could smell the aroma of the sago far away as the wind brought us the smell. We dig more and more information from the lady who was action cooking the sago. She managed to tell us that the Sago she currently cooks is known as Tumpik Sagu. They also called the sago as Tupik Sei, Tumpik Lemantak and Lempeng Melanau. We were really amazed with the smell. TumpikSagu is actually the sago that has been processed with bare hands. Puan Sue also mentioned about sago that is round in shape what we usually see. But, tumpik sagu is very rare to be found elsewhere. According to Puan Sue, the tumpik sagu can be cooked in 2 different ways via in the pan or the oven. Long time ago, the indigenous cook the sagu in the human-made oven. So basically, they have to cook the sagu a little more time than using the pan. This beautiful gastronomy of Melanau people are usually added on with some ingredients to make it tastier. As has been stated by Puan Sue, tumpik sagu generally has some salt, coconut and sugar added in. She has told us that, the indigenous itself resists to put in additional modern flavour. This is mainly because they really want to keep the originality of their food forever. Melanau people wants to maintain their culture for authenticity. 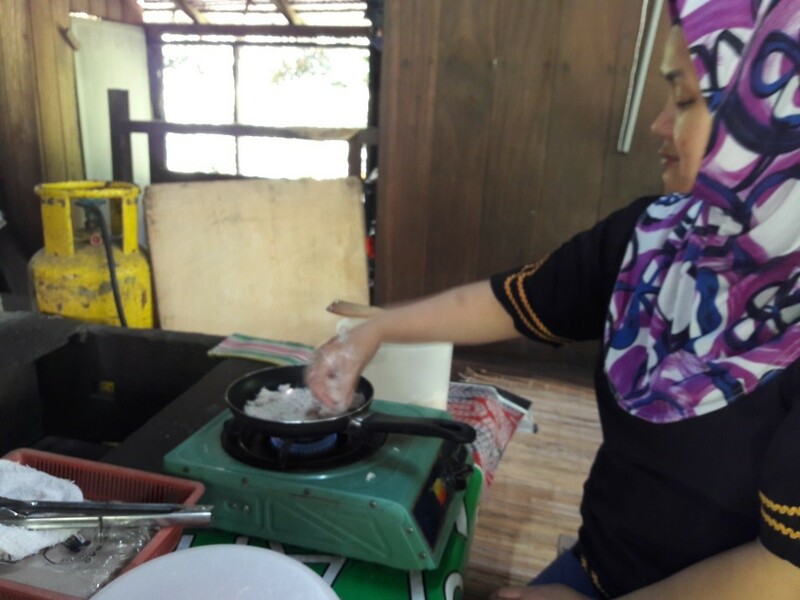 As we became curious about the other type of sago that were in front of us, Puan Sue came across to explain to us more about it. She even said that during the Japanese Era, it is hard to find rice. Therefore, they went to the jungle and found out there is another alternative to survive which the cassava that could replace rice. We were mesmerized with the personal story. Puan Sue told us that the sago in round shape is actually a lot harder to produce. She said this is because that the process to produce it involved grilling. 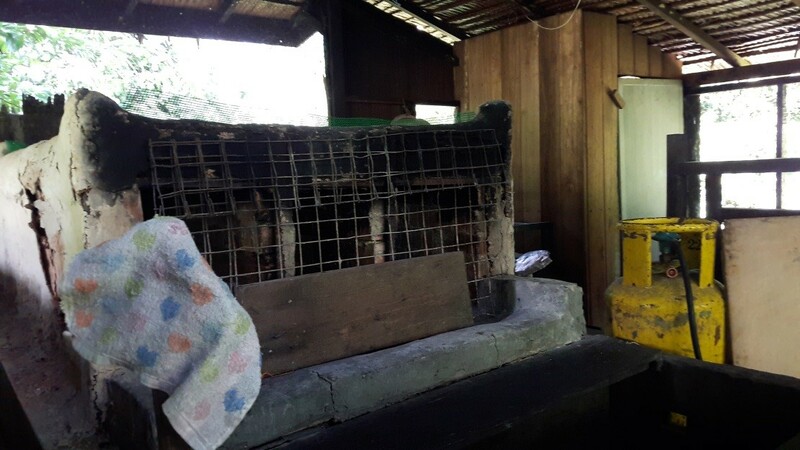 The Melanau purposely built a small house with fully covered air space to make sure that the sago could be processed faster and better. She even cracked some jokes by telling us that they are now getting used to the heat while processing the sago. We noticed that, people nowadays always forget what their culture really is until we realized the beauty of gastronomy in Borneo. If this article picks your interest to know more about sago, come over and visit us in Sarawak and get to know more not only about the Melanau tribe but also other indigenous tribes with their own unique identity.